There's a theory in certain conservative conspiracy circles that Hillary Clinton is not as healthy as she seems. When Clinton appears tired, or stutters, or uses a banister to climb stairs, some health truthers are quick to declare that her actions are evidence of some concealed illness. It shouldn't be terribly surprising, then, that when Clinton had a brief coughing spell during a campaign stop in Cleveland, Ohio, health truthers swarmed Twitter, and #HackingHillary was trending in minutes. I've read up on these claims that Clinton is secretly ill before, and I was not convinced of their validity — to put it mildly. Neither, apparently, are some other right-wing circles, who are instead convinced that Clinton's brief coughing jag must have been faked, a dodge to avoid answering questions. 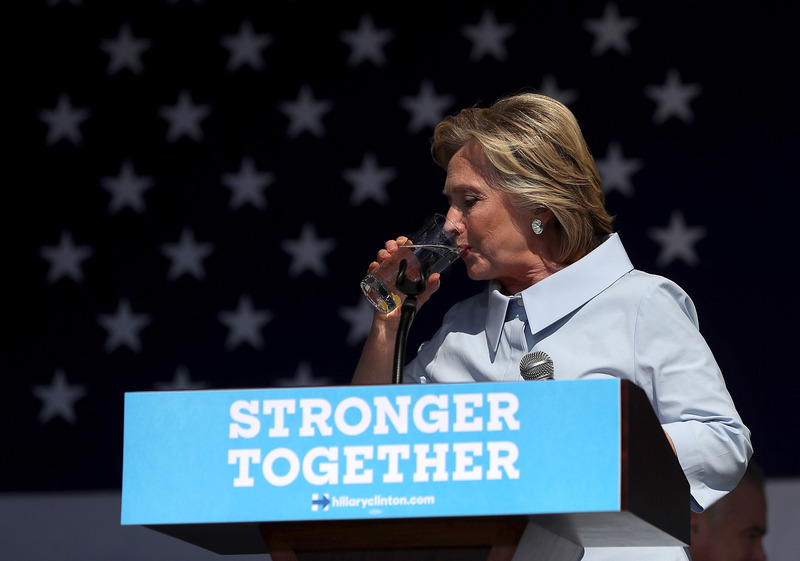 Clinton's story beggars belief: While traveling in Europe, she contracted a stomach virus... which made her dehydrated... which made her faint at home... which caused her to fall and hit her head... which gave her a nasty concussion. Since then, the injury has been fodder for accusations — both claims that Clinton fakes health injuries to evade tough situations, as well as allegations she is secretly unwell, to the point she's unfit to be president. Is Clinton "faking sick?" Is Clinton "faking health?" Her critics cannot seem to make up their minds. They also don't seem to care that her physician, Dr. Lisa Bardack, has stated in writing that Clinton is "healthy" but suffers from fairly minor conditions, "hypothyroidism and seasonal pollen allergies." Theories abound. But why? When other politicians cough, especially in inopportune moments, people may notice, but the coughs don't inspire such dramatic and outlandish conspiracies. It makes sense that someone who gives several speeches to large crowds every day would experience occasional hoarseness and coughing as a result. President Obama made headlines for coughing and requesting a glass of water during a discussion of the water crisis in Flint, Michigan. Even Trump supporter Ben Carson famously battled a cough during one of the Republican presidential debates last March. If the best evidence either health truthers or feigned illness truthers can marshal is the fact that Clinton sometimes coughs, consider me unconvinced.